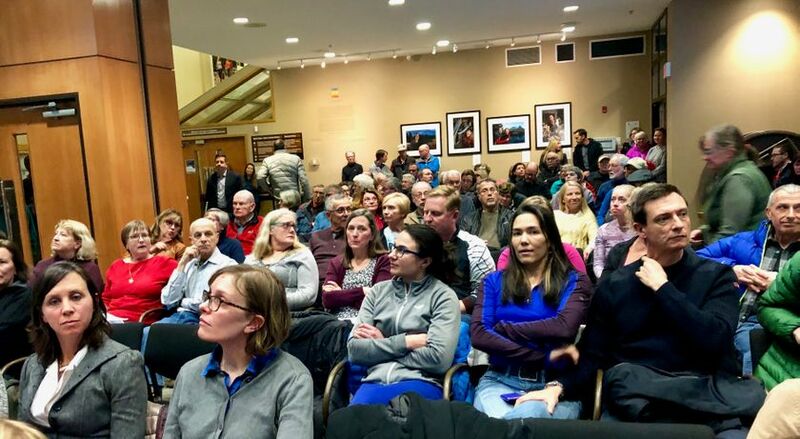 Canmore residents had their say at the public hearing for Peaks Landing District Bylaw 2018-14 at the Council chambers on January 29, after Council received a new application in January to rezone the area and allow development, and approved the first reading. Roughly 100 people attended the three-hour hearing. The majority in attendance were opposed to the proposed development. Most concerns raised included flooding risk, an increase in traffic, endangering the wildlife corridors, increased human-wildlife encounters and creating an unsightly development view from Quarry Lake. The proposed application states development would be divided into three sites: “Site one would allow for up to 14 townhouse units and the applicant has a signed agreement with Canmore Community Housing Corporation (CCHC) that seven of these be Perpetually Affordable Housing (PAH) with the other seven being a form of “market affordable” housing.